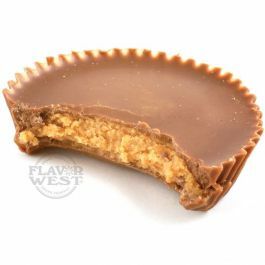 Peanut butter cup is a mix blend of milk chocolate and peanut butter flavoring. It offers a superior taste to baked treats and beverages.. A drip is sufficient for the typical baking recipe. Type: Peanut butter cup Water Soluble Flavoring. Ingredients: Natural and Artificial Flavoring, Propylene Glycol and Ethanol. USP Kosher Grade Flavoring. Usage Rate: 15-20% for E-use. Flavor Suitability: Suitable for drinks, beverages, cakes, desserts and pastries, cookies, ice-cream, pies, and more. Specific Gravity: 1.01 No Refunds on Flavoring.